Hundreds of thousands of protesters flooded the streets of Caracas on Sept. 1 to demand the end of socialist rule in Venezuela. 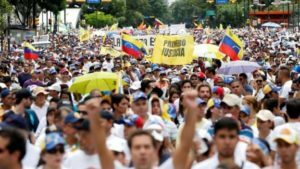 Chanting “this government will fall,” the protesters aligned with the opposition Democratic Unity coalition called for a recall referendum against President Nicolas Maduro amid a deep economic crisis in the South American OPEC nation. “We are going to bring down Maduro!” protester Naty Gutierrez said. “We are going to defeat hunger, crime, inflation and corruption. They’ve done nothing in 17 years. Their time is finished,” she said. Maduro’s government, which mounted its own, smaller counter-protest, did not give numbers for the turnout. The opposition is urging the national election board to allow a plebiscite on his rule, which is allowed by the nation’s constitution half-way through a presidential term. The socialist policies instituted by Hugo Chavez, who took power in 1999, and continued under Maduro have led to triple-digit inflation, a third year of recession and shortages of basic necessities. Maduro, who has just 20 percent support from Venezuelans, denounced the protests as a front for a coup. “We have stopped the coup today, the violent, fascist ambush,” Maduro told supporters.